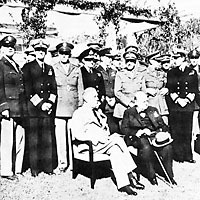 The Casablanca Conference took place just two months after the Anglo-American landings in French North Africa in November 1942. At this meeting, Roosevelt and Churchill focused on coordinating Allied military strategy against the Axis powers over the course of the coming year. They resolved to concentrate their efforts against Germany in the hopes of drawing German forces away from the Eastern Front, and to increase shipments of supplies to the Soviet Union. While they would begin concentrating forces in England in preparation for an eventual landing in northern France, they decided that first they would concentrate their efforts in the Mediterranean by launching an invasion of Sicily and the Italian mainland designed to knock Italy out of the war. They also agreed to strengthen their strategic bombing campaign against Germany. Finally, the leaders agreed on a military effort to eject Japan from Papua New Guinea and to open up new supply lines to China through Japanese-occupied Burma. The policy of demanding unconditional surrender was an outgrowth of Allied war aims, most notably the Atlantic Charter of August 1941, which called for an end to wars of aggression and the promotion of disarmament and collective security. Roosevelt wanted to avoid the situation that had followed the First World War, when large segments of German society supported the position, so deftly exploited by the Nazi party, that Germany had not been defeated militarily, but rather, had been “stabbed in the back” by liberals, pacifists, socialists, communists, and Jews. Roosevelt also wished to make it clear that neither the United States nor Great Britain would seek a separate peace with the Axis powers.